With more IIHS Top Safety Pick+ and best overall value awards than any other vehicle manufacturer, Toyota has dedicated immense time and effort into making sure theirs are among the top family-centric vehicles in the world. With this in mind, Toyota develops family-friendly SUVs that are practical, long lasting, and, of course, fun to drive. Whether you choose the Highlander, 4Runner, Sequoia, or the all-new CH-R, you'll be driving a high-quality sport utility vehicle that's versatile enough to handle whatever you and your family can throw at it. To help you decide which Toyota SUV is right for your family's needs, the specialists at our Toyota dealership in Braintree, MA have highlighted some of the features they think you'll most appreciate. If you have any initial questions before you continue, take a moment to give us a call at (781) 848-9300 and our experts will be happy to answer all of them to your complete satisfaction. When it comes to combining form and function, all of the models in the Toyota SUV lineup have something exciting to offer. To determine which has the interior and exterior features to suit the needs of you and your family, the chart below details what's available with each Toyota SUV model. When it comes to safety and technology features, Toyota's SUV lineup has a lot to offer. Featuring Toyota Safety Sense™ P (TSS-P) and/or the impressive Star Safety System™, each Toyota SUV puts safety first with a myriad of passive and active safety features designed to enhance situational awareness while decreasing the chance for collisions to occur. 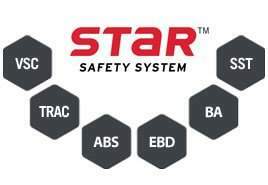 The table below outlines the safety systems available with each SUV. Toyota makes all of their SUVs to be spacious and comfortable. If you have an established family that needs a lot of space, the CH-R or RAV4 are perfect options to consider. If you have a growing family and need an SUV that can comfortably sit your kids and their friends, you will definitely want to look at the Highlander, 4Runner, Sequoia, or Land Cruiser. The ideal way to make sure you have a vehicle that can handle everything from your daily routine to family vacations, SUVs from Toyota are all designed to be incredibly versatile. Schedule a Test-Drive in Braintree, MA Today! If you would like more information on any of the SUVs available at our Toyota dealership in Braintree, MA or how you can schedule a test drive, don't hesitate to contact us using the form on our website. We also encourage you to give us a call at (781) 848-9300 to speak directly with one of our specialists.